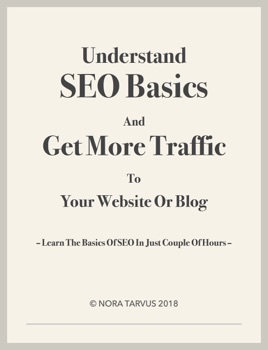 Understand SEO Basics and Get More Traffic to Your Website or Blog teaches you all the essential SEO basics you must know to have a successful site or blog. The book includes things like what is SEO, basic SEO terminology, tools to measure your site performance and of course tips and concrete ways to find the pain points of your site and ways for website optimization. The tips and tricks included in this book are all things that are relatively easy to fix. First, you get familiar with writing good search engine optimized content. In addition to optimizing the text, you also learn to optimize your photos and other media forms. Moreover, you learn all you need to know about linking to other sites. Also, topics like improving security and speed are covered because those do effect on how search engines rank your site. To make this all measurable and simple to understand, you get SEO terminology including all the must-know basic terms of search engine optimization. Additionally, you get a list of tools and sites you can use to website optimization. This list offers you things like free tools for measuring your site’s SEO related scores and making your site easier to read. In addition, the list includes some great plugins for bloggers to use, some great sites for high-quality photography and tools to calculate and improve the speed of your website. The tips and tools included are optimal for bloggers and small business owners relatively new to search engine optimization. Reading this book takes only a couple of hours, and it helps your site stats to skyrocket! The author of this book has been a blogger since 2008 and has blogged for multiple blogs internationally over the years. Additionally, she has been creating content for companies and other blogs under her own business. All those years have taught her a lot about SEO. Understanding SEO basics for bloggers is nowadays something a blogger must know to succeed. Also, when you’re writing for a company site, you should have at least some understanding of search engine optimization. With this book, you learn the basics of SEO in just a few hours! The most effective way to use this book is to first analyze your site or blog with tips offered in the very beginning of the book and then go through the tips, and while doing that simultaneously make your site better optimized. So, if you’re wondering how to get more website traffic, how to optimize your site or even what’s SEO and why you should do that, this book is a perfect resource for you!